At Dodger Stadium – especially on Friday nights at Dodger Stadium – there’s a magic that lives and breathes inside Chavez Ravine. It’s 27 outs, and until those 27 are nailed down; the Dodgers have more than a puncher’s chance. No matter the deficit, no matter the odds; don’t you dare go to bed or bet against them. On the day that Magic Johnson declared that “The Dodgers will win the World Series, it’s our year” the Bums had one of their most memorable victories all season long against the rotten and hated rival Giants. Corey Seager got things underway with home run number 17 off Matt Moore to put the Dodgers up 1-0 in the first. But he wasn’t done. 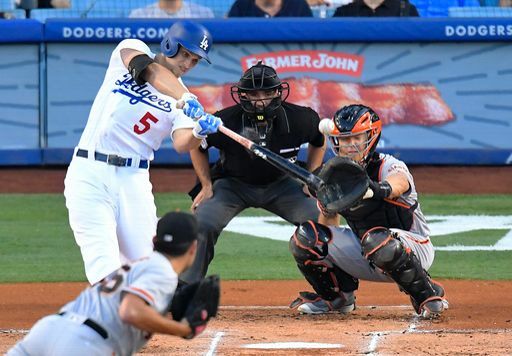 The Dodgers got down in a 4-2 hole, and little by little they clawed back to tie the score 4-4. 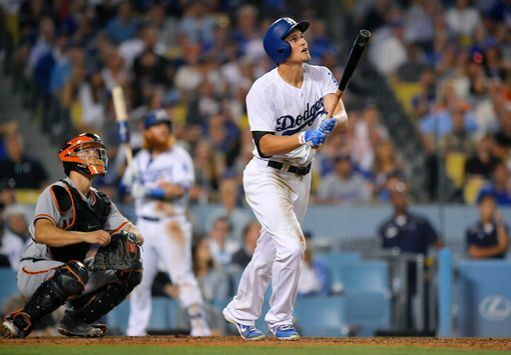 And Corey Seager saved his biggest swing for the biggest moment. Seager’s swing is just the greatest there is when he’s locked in. And like The Natural or The Mick, he just puts his head down and runs the bases humbly. No curtain call. No hair flip. No fanfare needed. Slow heartbeat. Seager’s 18th home run of the year. As Joe Davis said, it has happened again. The Dodgers are just absolutely never dead. They are the best team in baseball; just when you think not having Clayton Kershaw will make them slightly more human, you are corrected by what you see. They are not mortal men.